Georgie, the first smartphone designed for blind people, has been recently launched in UK. 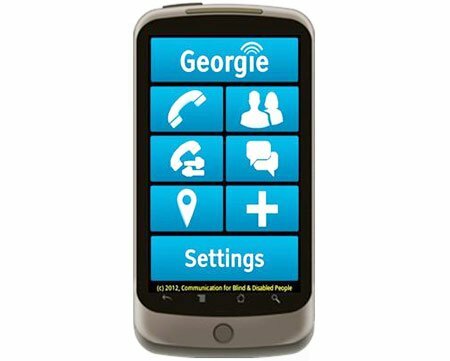 Georgie, as the device is known, has a voice-assisted touchscreen and offers a variety of apps to help complete tasks such as catching a bus, reading printed text and pinpointing location. The phone was designed by blind husband-and-wife team Roger and Margaret Wilson-Hinds from Peterborough. It was named after Margaret Wilson-Hinds’ first guide dog. The couple run a not-for-profit social enterprise Screenreader. The handset is powered by an Android operating system and uses existing Samsung handsets such as the Samsung XCover and Galaxy Ace 2. “I was able to send my very first text just earlier this year thanks to Georgie,” said Roger Wilson-Hinds. “It’s exactly the type of digital experience we want to make easily available to people with little or no sight. It is also going to help solve everyday problems for blind people so they can be more confident about navigating the real world and become independent,” he said. “Georgie is to be commended for allowing users to access the features of a range of modern smartphones in an easy-to-use and accessible manner,” he added. The smartphone lets users dial a number with the voice-assisted touchscreen and uses speech input to send text messages. Other apps are available in three different bundles; travel, lifestyle and communicate. Each bundle costs £24.99 ($40). The phone is being distributed by Sight and Sound Technology, a firm which provides hardware and software to blind and visually- impaired people. It is available from £299 ($475) or, for those with existing Android smartphones, a downloadable version can be purchased from Google Play, priced at £149 ($235). It comes pre-loaded with a data SIM card. Users with pre-existing phone contracts can have it transferred to the new device or install a pay-as-you-go SIM card. In the UK almost two million people are living with sight loss, with 360,000 registered as blind.